Oracle provides three ways to manage ASM: (1) through SQL, (2) through the web-based database console or grid control, and (3) through the server-based java GUI tool DBCA. These are your choices for adding storage, replacing a disk, growing a volume, etc. But if you’re an experienced DBA who recently started playing with 11gR2 ASM, you may have been surprised to find that DBCA is missing from the ASM/grid installation! DBCA is not missing by mistake – this is a change in Oracle 11g Release 2. There is a new server-based java GUI tool for ASM management: ASMCA. You might remember that there haven’t been major changes in Oracle clustering since version 10gR1 – when Oracle introduced their Clusterware package. But 11gR2 brings big changes and big new features to database clustering. You can’t defer storage configuration until after CRS installation. Furthermore, raw/block storage is no longer supported. Before you begin the CRS install you must either (1) install and configure a Cluster Filesystem or (2) prepare storage for ASM. You can’t do any ASM operations when connected as sysdba! A new role called “sysasm” was introduced in 11gR1… it’s now the only way to manage ASM. Connect / as sysasm. There’s a new tool called ASMCA to manage ASM. DBCA isn’t even installed in the ASM/Grid home. 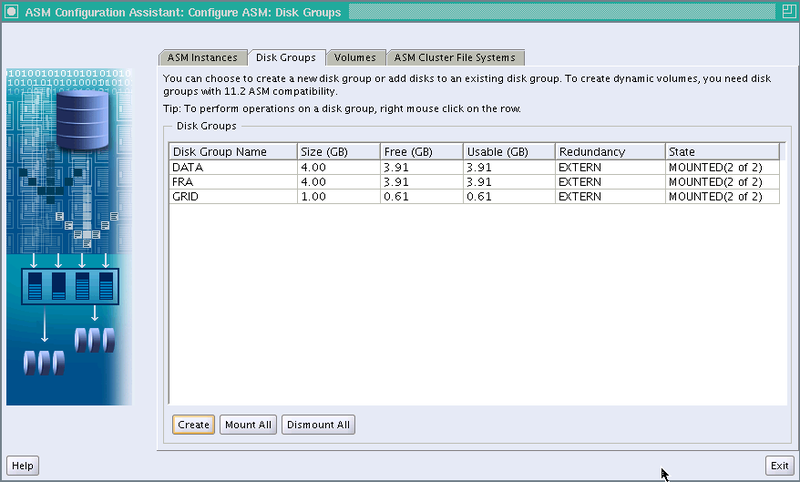 This tool is pretty slick – it also manages the new ASM dynamic volumes and ASM cluster filesystems. I noticed that there wasn’t much on google about ASM and DBCA. Hopefully this will save you a few minutes of head-scratching if you’re trying out 11g Release 2 for the first time. Happy testing! « Michigan OakTable – Illinois Visitors?